Sun, mountains, and what may have seemed like relatively warm temps allowed the IBU World Cup events to proceed on Thursday in Canmore, Canada. It’s been Polar Vortex cold in Canmore. Cold enough to thwart the original plans for traditional length 20-kilometer and 15 k individual races, for men and women respectively. With cold temperatures predicted all week, and a window of legal-limit warmer weather punching through on Thursday, the races were shortened to provide enough time during the warming window to hold both races. For the men, this fill in the blank is easy: _________________ dominated the day in the men’s 15 k short individual race as he shot clean and skied faster than all the others. Johannes Thingnes Bø of Norway did shoot clean. And he skied fast. And he won in a time of 35:27.9 minutes. For the twenty-four-year-old Bø, it was his 12th win of the season as he continues to cement his grip on the IBU World Cup overall. His Norwegian teammate Vetle Sjåstad Christiansen, finished second (+2:10.2, 1+0+0+1), with Alexander Loginov in third (+2:41.0, 1+1+0+0). Canada’s Chirstian Gow posted a career best 10th place. Gow stopped the clock 3:05.4 minutes after the winning time, as he went 0+1+0+0 for a single penalty on the shooting range. For the U.S., Sean Doherty was the second best North American in 27th. Doherty finished 4:29.0 minutes behind, and went 0+1+0+1 on the range. “Today the shortened format was welcome as the snow conditions were very abrasive and slow. as far as a tactics go the shorter distance is just a bit more aggressive pacing but that’s about it,” Doherty wrote FasterSkier to explain how the shortened race might impact his race strategy. Much of the past week was prohibitively cold for athletes. Some ventured outdoors for training, with many making due with local gyms and indoor training facilities. For the U.S., Leif Nordgren raced to 43rd (+5:48.3, 0+1+0+1), Max Durtschi 71st (+7:52.5, 0+2+1+2), Travis Cooper 73rd (+8:01.0, 1+1+1+2). Also for Canada, Scott Gow placed 40th (+5:42.6), Jules Burnotte 57th (+7:00.2, 3+1+2+0), Aidan Millar 81st (+8:34.0, 2+1+1+2). The women’s 12.5 k short individual race was run with increasing cloud cover and temperatures hovering around 10 degrees Fahrenheit. Norway’s Tiril Eckhoff took the win in 36:32.9 minutes with a single penalty. It was Eckhoff’s first career IBU World Cup win in the individual event. The Czech Republic’s Marketa Davidova raced to second as she cleaned her shooting stages and finished 9.2 seconds back. Lisa Vittozzi of Italy was third, 20.9 seconds behind, while also shooting clean. Megan Bankes was the top placed Canadian in 26th (+3:14.5, 1+0+1+0). 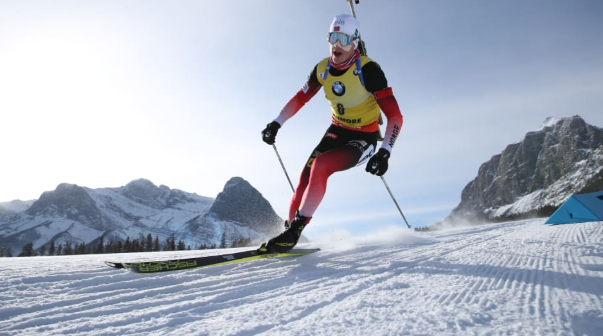 Canmore’s local biathlete Rosanna Crawford was 29th (+3:21.7, 0+1+0+1). Sarah Beaudry was 34th (+3:36.5, 1+0+1+0), and Emma Lunder 63rd (+5:51.3, 1+0+4+1). Clare Egan was he top American in 43rd (+4:17.5, 1+0+1+2). Joanne Reid skied to 64th (+5:55.9, 0+2+1+1), Emily Dreissigacker 66th (+6:07.1, 0+0+0+2).